How to play CatchUp CoverAll? At the start of each round, you have the chance to pick a pair of "Flip Flop" numbers for a special chat game and a Lucky Ball that could win you 2000 GVs (see full rules below). If you enter the current game late, you won't be able to make picks for that game. However, you will before the next game begins. To win CatchUp CoverAll, check off all the numbers on any one of the three bingo cards provided, then click the "Bingo!" button. The first valid claim wins. 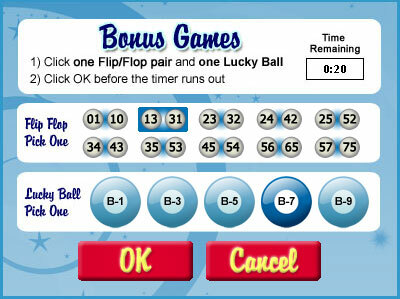 To be valid, all numbers checked off on your cards must correspond to the numbered balls shown on the bingo board. Use your mouse to check off numbers on your bingo cards. When you click a number on a bingo card, it will display a daub mark to show it has been checked. You can remove the daub mark by clicking the square a second time. When the game begins, several balls have already been called--so Catch Up! The game ends after 62 bingo balls have been dropped, whether or not there is a winner. When a CatchUp CoverAll game ends, it is followed by a brief intermission, then a new game begins. CatchUp CoverAll runs around the clock, 24 hours a day, seven days a week. CatchUp CoverAll includes an optional bonus game called "Lucky Ball" that can be played alongside the main game. In the moments before each game begins, you are presented with a grid of nine bingo balls (B-1, B-2, B-3, B-4, B-5, B-6, B-7, B-8, B-9). To play, select one of the numbers by clicking on it and then click the submit button. You can see your Lucky Ball on the screen during the game, but cannot change your Lucky Ball mid-game, only before each game starts. NOTE: If you enter during an intermission, or after the current game has begun, you may not be eligible to play Lucky Ball. When someone wins the jackpot prize, up to four random players in that game, with the same current Lucky Ball choice as the winner, each wins 2,000GVs as a bonus prize. If the winner has not selected a Lucky Ball, no one receives the bonus prize. If no one's Lucky Ball matches the Lucky Ball selected by the winner, no one receives the bonus prize. CatchUp CoverAll features two optional chat games that can be played alongside the main game. "Flip/Flop" is one of these chat games. In the moments before each game begins, you'll be presented with several pairs of "flip flopped" bingo balls (eg, 12/21 or 13/31). When your 2 "flip/flop" numbers are called type "flip/flop" into the chat and click the "Send" button. Win 242 bonus GV Rewards! 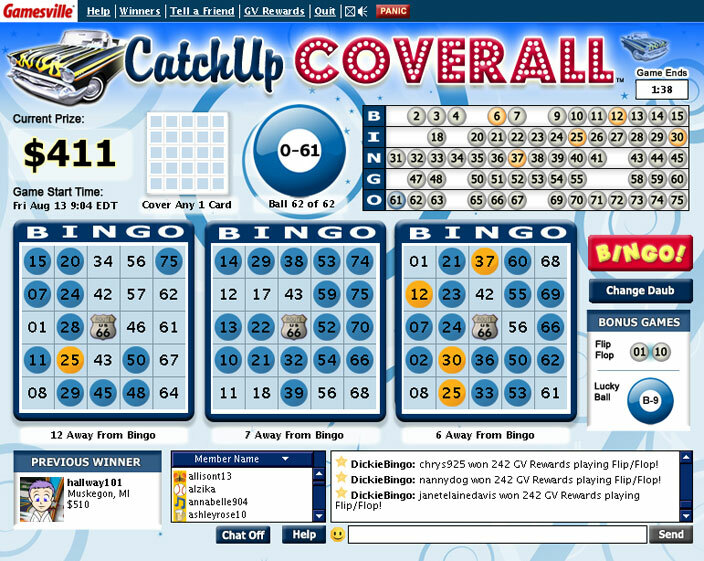 CatchUp CoverAll features two optional chat games that can be played alongside the main game. "Lucky Ball" is one of these chat games. This is your Lucky Ball. When someone wins the jackpot prize, everyone with the same Lucky Ball choice as the winner gets 2,000 Bonus GV Rewards! If the jackpot winner has not selected a Lucky Ball (because they entered the game late, or elected not to choose one) everyone receives 500 bonus GV Rewards.